Cycling can be healthy but it’s not without its dangers. If you’re a frequent cyclist, it is essential to have good, durable efficient lights for your cycle. Bike lights are excellent for both your safety as well as that of other road users. The best bike lights ensure you can clearly see your surroundings when you are in areas of low light. They also assist other motorists with spotting you often before you see them. Whether you travel early in the morning or late at night, being spotted by other road users is essential if you wish to cycle safely. Bike lights can be clipped to either the front or rear of your bicycle and do not hinder your journey. They commonly come in red if designed for the rear of your bike. If they are built for the front, the bulb is frequently a white or lighter colour. They are also becoming more commonly used in areas that are both rural and developed. This has led to them being more widely available and therefore cheaper. Before you buy bike lights for your bicycle it is important to consider what you are specifically looking for. Different cyclists travel in different areas with differing public light. Some lights are powered in different ways and different brands of light are priced in different way. Use our bike light reviews to find your perfect fit. How much are you looking to pay? Quality bike lights can cost you anywhere between £5 and £60. If you are willing to part with a substantial amount of money, it might be better to look at the higher end of the market. This will feature bike lights specifically designed to experienced cyclists. They are also likely to be specific to your required needs. For example, you may have had positive experiences with a particular well-known brand. This will also allow you the freedom to choose the desired colour for your bulbs. You may also have a specific requirement for the way you charge up your lights. Having an increased budget gives you the freedom to readily pick the lights that will suit you best. You may on the other hand be looking at a lower budget. If this is the case, you will need to decide the most important requirement for your lights. A low budget may restrict you to picking one important perk directly relevant to your needs. Bike lights can be powered in a number of different ways. Some require disposable batteries or a USB charge. For these, it is important to consider how you will keep your lights powered. If you travel for long distances in the darker hours, are you going to be able to recharge your USB bike lights quickly? Do you have the room in your backpack to carry several sets of batteries? Will you be able to quickly recharge your lights if weather affects light conditions? It’s important to decide which method you prefer to keep your lights charged and whether this will affect the amount you are willing to spend. Its important if you’re used to cycling long distances that you have bike lights with an adequate battery life. There is nothing worse than running out of power when you are halfway through a long journey or if the weather takes an unexpected darker turn. As a result, it is handy that you have a way to monitor the battery life on your lights so as to avoid them running down too quickly. The last thing you want is to have to change a tire in near darkness and then travel home the same way. Are you looking for a specific brand of bike light? Experienced cyclists can often prefer to stick with a favourite brand of cycling-manufacturer. This can be because they have had a high level of success with them in the past. It can be also be as a result of fervent advertising or a recommendation from a friend. It is also recommended to stay with a well-known brand of bike light (such as Cateye or Cycle torch). Sticking with a reliable well-known brand means you can address the manufacturers with any faults you encounter. It is also a much better way to get value for your money. Due to the diversity and availability of bike lights now, you have to be sure your lights will actually attach firmly to your bike-frame. Where do you need your lights to be situated? Some lights can be fitted to your helmet. You need to be sure this will not make your helmet tip and obscure your view. Others attach to your bikes frame. You need to be sure that your bike lights will not wobble or become damaged when you are riding on unsteady ground. You may need a bike light specifically designed for rough terrain if you live in a rural area. This sleek bike light attaches to the front handlebars of your bike and features the modes constant and flashing. It can be purchased with a white or black exterior based on your preference. This light is powered by 2 AA batteries and last for a reasonable amount of time (approximately 12 hours on constant). Despite this, the light is not ideal for pitch black conditions and would suit foggy or misty conditions better. The light will clip comfortably to most bike frame types and doesn’t move when fixed to your bike. This bike light has had problems in rainy weather before so would suit dry weather conditions. This is a good bike light with a price tag around £15 but would perhaps be directed at the casual cyclist rather than the professional. Click here for reviews, pictures and prices on Amazon. This is an excellent piece of equipment specifically designed for the experienced cyclist. This light attaches right away to your handlebars and features the following flash options: Full on, half-on, rapid strobe flash, and slow strobe flash. The light is more than sufficient to guide your path and make you clearly visible to other road users. The light can be easily detached and used as a torch which is ideal if you need to change a tyre. 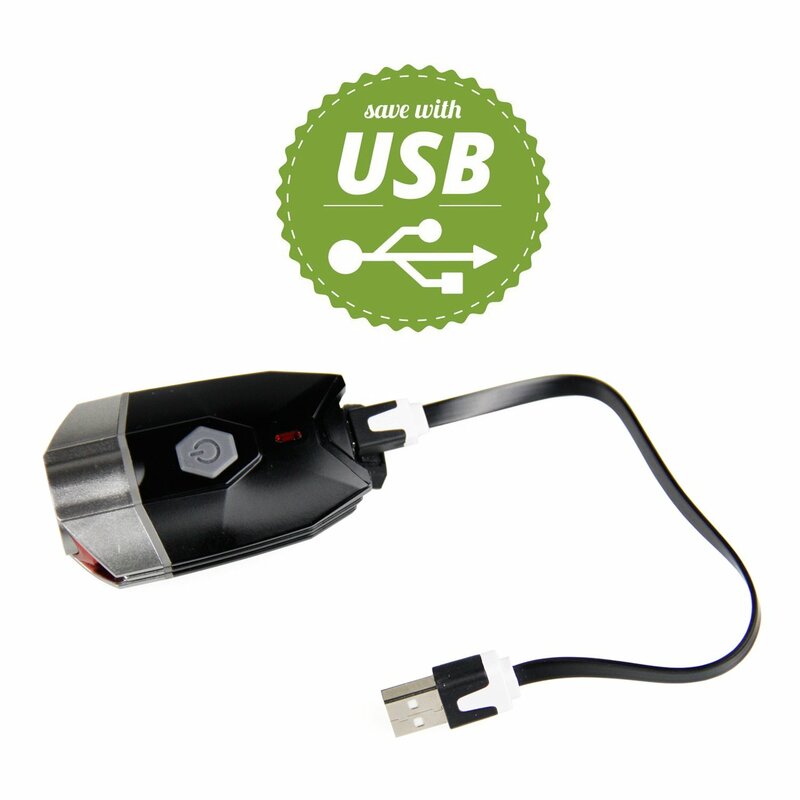 The bike light is recharged with a USB cable and can last for anything up to ten hours of continual use. With a price tag around the £25 mark, this bike light provides great value for money. This smart trendy bike light is able to be attached to either your handlebars or your helmet. It features a trendy black design with an aluminium front. This light has a formidable brightness ideal for night and features the settings bright, dim, and strobe. This light also features a USB charger with a lifespan of around 6 hours in between charges. It does however charge quite quickly. Due to its aluminium front, this light can be a little heavy and clunky. This can be more of an issue if you are intending to attach it to your helmet. Despite this however, this bike light is more than reasonable for about £15 and would suit cyclists on shorter journeys in darker conditions. This tidy looking bike light will attach comfortable to your handlebars without obstructing you or your bike at all. This light has 4 different settings: High, medium, low and flashing. The light is recharged once again by a USB cable but has a limited lifespan. On the highest setting this battery will only last for around 2 hours, however on its lowest setting it will give you anything up to 7 hours. This would be sufficient for riding at night. This bike light benefits from being water and shock-resistant but is slightly heavier than many other models. This light retails at about £15 but despite its strong brightness, it is let down heavily by its short lifespan. This would be better suited to a casual cyclist used to shorter journeys. This is a compact handy light that easily attaches to your handlebars and is easy enough to use. It features one button that you simply press until your light reaches your desired lighting mode. This particular bike light features 4 different modes, these are high, medium, low and flashing. This bike light is once again USB rechargeable. Its maximum lifespan on the lowest setting can be anything up to 7 hours but will struggle to get past 2 hours if it is kept on high. For this reason, this light would be unsuitable if you are frequently riding in low light. This light generally retails around £15 but is let down majorly let down by its short battery life. Its simple operation do make this bike light ideal to adjust safely as you are riding so this light would be better suited to cyclists in low light for short periods as opposed to complete darkness. The best budget bike lights? Unlike the previous bike lights, this light also comes equipped with a red rear bike light. It is also the cheapest model, retailing at around only £10. The front light can be easily fastened to the handlebars or your helmet. It has a different style to the previous almost resembling a torch. The light is sufficient to light your way and be focused to zoom into one spot. This is ideal for lighting your way but is less effective at making you visible to other road users. The light also comes complete with settings for full brightness,half brightness and a flashing mode. The red rear light will comfortably attach to your bike frame and although dull, will make you visible to other motorists. Unfortunately this light is powered by batteries which can make it slightly clunkier and will require changing on a frequent basis. Despite this, this products cheap price-tag would make it appealing perhaps to a casual cyclist. This slick rechargeable bike light is a great lightweight option to attach to your bikes frame. It features a USB charger with an excellent charge time of around 3 hours. Fully charged, this bike light will last for anything up to 12 hours on flashing mode, 6 hours on medium and 3 hours on bright. Its compact size add to this products great design and its price-tag of under £10 make it great value for money. On its brightest mode, this light is great for lighting the road in front of you in particularly dark light as its shines a strong direct beam. This light has one drawback as it has been known to fail during heavy rainfall. Despite this, in dry weather this item provides great value for money and would suit the casual cyclist. This is a professional looking bike light set produced by the well known and reliable cycling brand Hodgson. This bike light looks incredibly professional and is aimed at the experienced cyclist. It also comes complete with a red flashing rear light to ensure you are safely lit up on the road. The front light features a strong white beam and features the modes High, medium, eco and flashing. The rear red light however features 6 different modes. These are High, medium, low, 100% flashing, 50% flashing and eco. This means you can get the visibility you need based on the light levels you are encountering. Both of these well-designed lights are USB charged with a 2-3 hour charging time. One criticism is that due to their power, they can only remain charged for up to 2 hours on their highest modes. However, their range allows the cyclist to adjust the strength required for the light your are encountering. For the price of around £25 to £30, its is a professional set that reflects the quality of its manufacturer. This comes highly recommended for experienced cyclists. This super bright bike light has an extraordinary amount of power for its size. Attached to your bikes handle bars, it can project a powerful beam to light your path. This light has 3 different types of beam: full, low and strobe. This makes it suitable for low light and darker. This particular light is charged with a battery pack and comes complete with a charger of its own. The light does charge up in a couple of hours and on its strongest beam generally last around 4 hours. The light itself is water resistant however the battery pack is not. For this reason, this light would be better suited away from wet weather. One other criticism of this light that it is quite quite bulky and therefore quite heavy. This light is generally priced around £25. It is definitely a strong beam and works superb in darkness but its size and heaviness do slightly take away from this light. This impressive looking bike light has a powerful beam that easily lights up the road in front of you. For this reason, due to its intensity it is recommended you point the light at the road as opposed o directly in front of you. The light itself has an excellent broad beam ideal for even the darkest night. The front light features the following 4 modes: high, medium, low and strobe. This allows you to be see ahead and also be safely seen by other motorists. This light also comes complete with a free rear red light for no extra cost. This light comes complete with a charger of its own and charges in a couple of hours. On the highest mode, this light can last anything up to 8 hours. It clips well to your handlebars and doesn’t shake when on bumpy terrain. Priced at around £20, this bike light offers great value for money and is especially good in zero light. If you are a dedicated cyclist, the bike lights you are most likely to be interested in are the more expensive and efficient models from brands such as Cateye, Hodgson and Sunspeed. These products are specifically designed for riders who have experience of riding in low levels of sunlight and are the best bicycle lights in this situation. You must also consider your preferred charging method and the price you are willing to pay for the optimal model. The cheaper models seen here are ideal for the casual cyclist, the majority of which are unlikely to be travelling at times when there is little to zero visibility. On the whole, all of these bike lights provide good value but it is worth paying the extra for the bike light that suits you best. This entry was posted in Cycling Equipment.